I’d seen several projects on the net to make analog synthesizers, including the classic Atari Punk Console. I’m anxious to design something of my own, but I’m still learning, so I thought I’d start small. While this is not something that hasn’t been done before, I did it entirely from scratch. I read datasheets, and experimented with values for components. I did this project iteratively, first implementing a single oscillator controlled by a variable resistor or potentiometer. The capacitor I chose (220 pF) was somewhere in the middle of the range recommended by the data sheet, though I tried several other values. I have a cheap analog scope, and I could see the oscillation, but when I tried to attach a speaker, it went dead. I hooked up a piezo element and it could drive that, but it wasn’t very loud. I stuck in a 2N2222 transistor, and used a pot to determine the optimal (loudest) bias resistor for the base, and replaced it with a fixed value. Next, I replaced the pot with a photoresistor. This was fun, but the tone was pretty boring (plain square wave). I then hooked up another gate to drive an LED. Pointed at the photo resistor, but some distance away, it provides a cool beat, while the “average frequency is determined by the other light hitting the photoresistor. 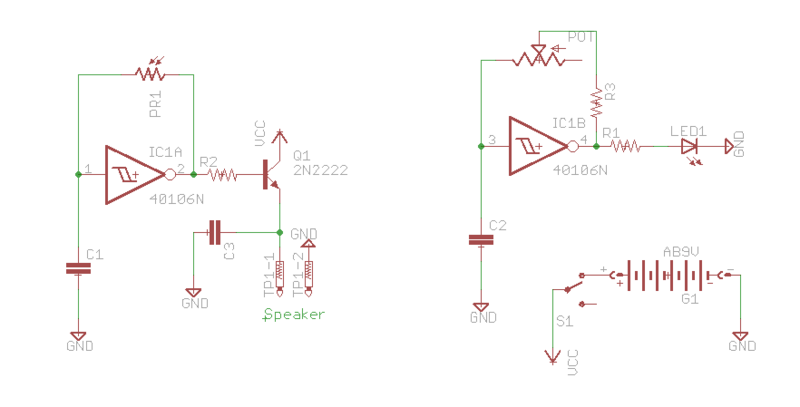 The frequency of the beat is controlled by a potentiometer like in the first circuit. One tip: You’ll notice R3 in series with the potentiometer. This is because the pot goes all the way to zero, and at zero resistance the cap won’t charge and discharge properly setting up the oscillation. This sets some non-zero base value that you can set experimentally based on what you want that end of the frequency range to be.